Aberdeen manager Derek McInnes believes Rangers should be embarrassed they will finish behind the Dons this season. Gers manager Pedro Caixinha’s claim the Dons are about to be usurped by the Light Blues has angered the Aberdeen manager, who takes his side to Ibrox tonight. McInnes claims his Portuguese counterpart has failed to grasp the magnitude of his role at Ibrox if toppling the Reds is the height of his ambition. The Dons manager said: “I think it’s strange he feels the need to talk about Aberdeen so much. “The job of Rangers manager is to finish above Celtic and he should be more concerned about that challenge.“Any team that finishes above Rangers in the league, with the budget they have, is doing their work well. “If he thinks them being on the up and being brilliant by finishing above Aberdeen is good work by him then he’s way off the mark. “They should be embarrassed they’ve not finished second. “The Rangers supporters are used to having people do a lot of talking towards them, whether that’s owners, managers or players, saying what they want to hear. “The reality is the job of a Rangers manager is to finish above Celtic. 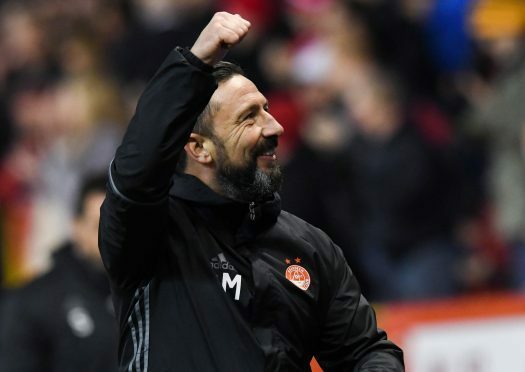 Caixinha has been quick to lob arrows at the Dons since replacing Mark Warburton at Ibrox, but McInnes believes the Rangers support expect more than what the Gers have produced this season. He said: “We all have a different way of managing and I think he likes to say what the Rangers sup-porters want to hear. “But the Rangers support can’t be kidded because they have been over that course before. “Rangers should be finishing second with the budget they have, there’s no doubt about that. Caixinha’s focus not only is on the Dons but on captain Ryan Jack with the Gers manager also only too happy to reveal his admiration for the midfielder. Jack is out of contract in the summer and the Rangers manager believes the Dons captain is the sort of player he needs at Ibrox, but McInnes has reiterated his belief if his captain does leave it will not be for Ibrox. He said: “At this stage of the season you always get asked about players and speculation. “That’s the job we are all in and it’s normally the unwritten rule we don’t talk about other teams’ players. I think that’s how the majority of people manage. “I don’t think he should be speaking about one of my players, but each to their own. Will Ryan go to Rangers? I don’t know, I have no idea. I have spoken to Ryan often enough and he’s told me his intention is to go to England if he doesn’t stay here.